The weekend sports shifts at Global have been a nice change of pace the past couple of weeks and they give me the opportunity to further refine my TV writing and editing skill-set. Sticking with sports, my latest episode of Second Serve has been the best-received of the series. Most likely, it has nothing to do with me and everything to do with Daniel Nestor being my guest. Daniel was a great sport and we had a lot of fun filming the above. He also gave me legitimately fantastic tips to help my game and I can tell they are already paying off. Before we went on court, I conducted a sit-down interview with Daniel for a retrospective on his storied tennis career. I have two more weekends of sports shifts forthcoming and then I'm taking off on vacation for 10 days. I think I may have some morning show shifts sprinkled in there as well. Oh, and before I forget. 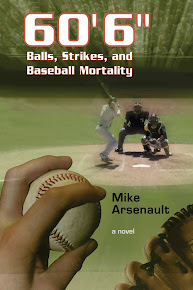 The baseball playoffs are underway (my favourite time to be a sports fan) and there are now less than a dozen copies of my baseball novel left to purchase. You can buy one online here. It also makes a great Christmas gift for sports fans and non-sports fans alike!